Sticky Wages, Flexible Labor Costs? A growing number of employers, hoping to avoid or limit layoffs, are introducing four-day workweeks, unpaid vacations and voluntary or enforced furloughs, along with wage freezes, pension cuts and flexible work schedules. These employers are still cutting labor costs, but hanging onto the labor. And in some cases, workers are even buying in. Witness the unusual suggestion made in early December by the chairman of the faculty senate at Brandeis University, who proposed that the school’s 300 professors and instructors give up 1 percent of their pay. “What we are doing is a symbolic gesture that has real consequences — it can save a few jobs,” said William Flesch, the senate chairman and an English professor. At some companies, employees are supporting the indirect wage cuts — at least for now. The downturn hit so hard, with its toll felt so widely through hits on pensions and 401(k) retirement plans and with the future so murky, that employers and even some employees say it is better to accept minor cuts than risk more draconian steps. To be sure, these efforts are far less widespread than layoffs, and outright pay cuts still appear to be rare. Over all, the average hourly pay of rank-and-file workers — who make up about four-fifths of the work force — rose 3.7 percent from November 2007 to last month, according to the latest Labor Department data. The magnanimous feeling will probably pass, said Truman Bewley, an economics professor at Yale University who has studied what happens to wages during a recession. If the sacrifices look as though they are going to continue for many months, he said, some workers will grow frustrated, want their full compensation back and may well prefer a layoff that creates a new permanence. “These are feel-good, temporary measures,” he said. Update (12/31): Washington Post columnist Steven Pearlstein ponders the merits of sharing the pain through wage cuts. Lance, Inc. (Nasdaq: LNCE) today announced that the U.S. Bankruptcy Court for the District of Delaware has approved Lance's bid to purchase substantially all of the assets of snack food company Archway Cookies LLC ("Archway"). Under the terms of the Asset Purchase Agreement, Lance will acquire substantially all of the assets of Archway for approximately $30 million. The transaction is expected to close no later than December 15, 2008. Lance will use available liquidity under its current credit facilities to fund the acquisition. "We're excited about this acquisition," commented David V. Singer, President and Chief Executive Officer of Lance, Inc. "Archway was founded in the 1930s, and has built solid market share in its niche of soft, home-style cookies. Archway is an excellent addition to our growing portfolio of consumer preferred niche brands. We are looking forward to reopening the Ashland, Ohio production facility, where we intend to produce Archway cookies. This facility will also provide the capacity to support growth in our existing business and capabilities that will broaden the products we can offer our Private Brands customers, thus supporting our growth goals for our non-branded business." Thanks, Santa! U.S. Bankruptcy Court for the District of Delaware! The 81–82 recession graphs include data from 12 months before the first day of the recession to 12 months after the last day of the recession, therefore the dates range from 7/1/1980 to 11/1/1983. The 1980 recession ended in July of 1980, so these time periods overlap each other by one month. Including this month does not “understate the ‘badness’ of the period” because the calculations are based solely on the recessionary period being examined. In other words, the time span has no effect in this case. The first day of the recession is set to one. The months before and after are normalized to the first day of the recession. If we were to remove the 1980 recession date and run the time span 10 months before the 1981 recession to 10 months after, the graph does not change in anyway apart from a shorter time span. This is because the data is scaled to 7/1/1981, the beginning of the recession. That is correct, but it misses the point I was trying to make (so perhaps I didn't make it very clearly). What I was trying to say is: the two recessions, together, represent a very long period of elevated unemployment. There wasn't much "recovery" from the 1980 recession before the 1981-82 recession began. The unemployment rate was 6.0% in December 1979; it peaked at 7.8% in July 1980, before falling to 7.2% at the end of that year. In mid-1981 it began a new climb all the way to 10.8% at the end of 1982. The unemployment rate fell to 7.2% in 1984 (Morning in America*), but didn't make it all the way back down to 6% until August 1987! 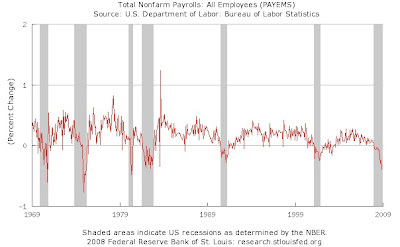 I've plotted the BLS nonfarm payroll employment series around the NBER business cycle peak dates of November 1973, January 1980, July 1981 and December 2007. The yellow line illustrates what I was trying to say... in 1980, America was at the precipice of some hard times. 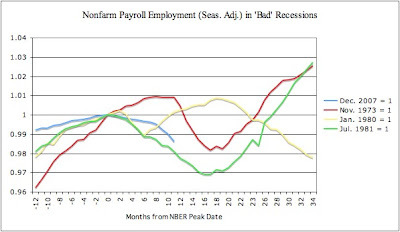 Now that the NBER has made its call, we know that we are 12 months out from the last peak. I'd like to hope that our position is more like July 1982 than January 1981 (i.e., I'd rather be at 12 on the green line than the yellow one). Of course, in the 1980's, we took a certain pride in being "Bad." *By the unemployment rate, in 1984, people were better off than they were four years ago, but not five. The Times reports on Larry "The Harvard Lighning Rod" Summers' "Path to Renewal." Will he be the Oscar Madison in a White House of Felix Ungers? The two men, who have forged their relationship in the tumult of the financial crisis, share a lot: Harvard, a love of debate, and firm convictions, like agreement on the need to narrow the gap between America’s most fortunate and everyone else. But they are also an odd couple: the serene, slender politician who seems to win people over effortlessly and the impatient, acerbic bear of a man who seems to offend them just as easily. The Recession: "Mild" Down and "Bad" to Go? At Macroblog, David Altig does wholesale what I've been doing piecemeal in several recent posts, comparing the current downturn with past recessions. He plots the recent movements in employment relative to both the "mild" recessions of 1991-92 and 2001 and the "bad" recessions of 1973-75 and 1981-82. Where we are still looks like a mild recession, but where we appear to be going looks like a bad one. The graphs are a good reminder of just how bad the bad ones were... we've still got a way to go before we get there. (Also, I think considering the 81-82 recession in isolation, rather than in combination with the 1980 recession somewhat understates the "badness" of that episode). Update (12/6): See also the Times' recession comparison charts which predate the latest employment numbers (as Dean Baker rightly notes, the comparison of housing prices is somewhat deceptive since it is not adjusted for inflation). The nation’s employers shed 533,000 jobs in November, the 11th consecutive monthly decline, the Bureau of Labor Statistics reported Friday. Not since December 1974, toward the end of a severe recession, have so many jobs disappeared in a single month, and the current recession appears to be just gathering steam. Of course, the labor force is much bigger now than in 1974, so in percentage terms, the decline is considerably smaller. The November decrease was 0.4%; December 1974 was an 0.8% decrease, and there were declines of 0.5% in November 1974 and January and February 1975, as well as May 1980. There were also 0.4% decreases in March 1975, June 1980, and January and July 1982. Overall, the 1973-75 and 1980/81-82 recessions featured several months with decreases in employment comparable to or larger than November 2008. However, as David Leonhardt notes, the rise in the unemployment rate was made smaller by a large decrease in the labor force, which suggests that some people are giving up on finding a job. The labor force participation rate fell by 0.3 percentage points to 65.8%. Who is Beggar-ing Whose Neighbors? 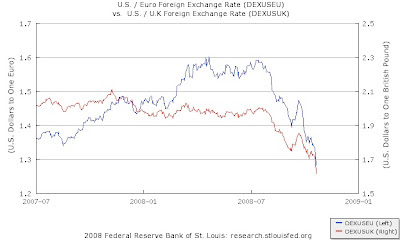 In normal times, current account surpluses of countries that are either structurally mercantilist – that is, have a chronic excess of output over spending, like Germany and Japan – or follow mercantilist policies – that is, keep exchange rates down through huge foreign currency intervention, like China – are even useful. In a crisis of deficient demand, however, they are dangerously contractionary. Countries with large external surpluses import demand from the rest of the world. In a deep recession, this is a “beggar-my-neighbour” policy. It makes impossible the necessary combination of global rebalancing with sustained aggregate demand. John Maynard Keynes argued just this when negotiating the post-second world war order. Some argue that an attempt by countries with external deficits to promote export-led growth, via exchange-rate depreciation, is a beggar-my-neighbour policy. This is the reverse of the truth. It is a policy aimed at returning to balance. The beggar-my-neighbour policy is for countries with huge external surpluses to allow a collapse in domestic demand. They are then exporting unemployment. If the countries with massive surpluses allow this to occur they cannot be surprised if deficit countries even resort to protectionist measures. (For a similar argument by Michael Pettis, see this earlier post). Now suppose that we had a way to raise the multiplier by more than half, from 1.8 to 2.8. The same fiscal stimulus would now produce an increase in GDP of $2.8 trillion--quite a difference. Nice deal if you can get it. In fact you can. It is pretty easy to increase the multiplier; just raise import tariffs by enough so that the marginal propensity to import out of income is reduced substantially (to zero if you want the multiplier to go all the way to 2.8). Yes, yes, import protection is inefficient and not a very neighborly thing to do--but should we really care if the alternative is significantly lower growth and higher unemployment? More to the point, will Obama and his advisers care? Being the open economy that it is, I fear that the U.S. will have to confront this dilemma sooner or later. In an environment where the dollar has already appreciated against the Euro and even more significantly against emerging market currencies, fiscal stimulus here will produce an even larger current account deficit. If American consumers decide to spend 40 cents of a dollar of additional income on cheap imports from China and other foreign countries, the multiplier will be a mere 1.3. How long will it take before politicians of all stripes cry foul over the leakage through the trade account and the "gift to foreigners" that this represents? And they will have Keynesian logic on their side. One would hope that a decline in the Dollar - though not too abruptly, please - could be an adjustment mechanism (even if panic-induced demand for US Treasuries has moved the Dollar in the other direction lately) but Chinn and Wei's finding that flexible exchange rates do not facilitate current account adjustment suggests otherwise. That's counter-intuitive, but I guess I shouldn't be too surprised; some of my own work has studied another aspect of the "exchange rate disconnect" puzzle. The committee believes that the two most reliable comprehensive estimates of aggregate domestic production are normally the quarterly estimate of real Gross Domestic Product and the quarterly estimate of real Gross Domestic Income, both produced by the Bureau of Economic Analysis. In concept, the two should be the same, because sales of products generate income for producers and workers equal to the value of the sales. However, because the measurement on the product and income sides proceeds somewhat independently, the two actual measures differ by a statistical discrepancy. The product-side estimates fell slightly in 2007Q4, rose slightly in 2008Q1, rose again in 2008Q2, and fell slightly in 2008Q3. The income-side estimates reached their peak in 2007Q3, fell slightly in 2007Q4 and 2008Q1, rose slightly in 2008Q2 to a level below its peak in 2007Q3, and fell again in 2008Q3. Thus, the currently available estimates of quarterly aggregate real domestic production do not speak clearly about the date of a peak in activity. Other series considered by the committee—including real personal income less transfer payments, real manufacturing and wholesale-retail trade sales, industrial production, and employment estimates based on the household survey—all reached peaks between November 2007 and June 2008. The committee determined that the decline in economic activity in 2008 met the standard for a recession, as set forth in the second paragraph of this document. All evidence other than the ambiguous movements of the quarterly product-side measure of domestic production confirmed that conclusion. Many of these indicators, including monthly data on the largest component of GDP, consumption, have declined sharply in recent months. The last time around, payroll employment peaked at 132.53 million in Feb. 2001 and bottomed out at 129.84 million in June 2003; the NBER's peak was March 2001 and the trough was November 2001; but employment was very slow to rebound. 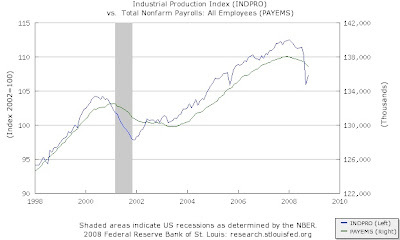 This one may be worse - the industrial production index sure looks scary, doesn't it? The announcement should at least put an end to the tedious "are we technically in a recession" arguments. But if we want to be pedantic (and, really, who doesn't?) we might note that we don't know that the trough hasn't already occurred. I sure don't think it has, but the turning points usually are only clear in retrospect. So it would be a little premature for the folks at FRED to put in another "shaded area." Update: I've removed the sentence where I mixed up the 2001 and 1990-91 recessions (d'oh!). “I think there’s reason to doubt the Revolution would have happened as it did if it weren’t for these economic conditions,” said Ronald W. Michener, an economics professor at the University of Virginia, in a radical departure from today’s popular notion that the Revolution was a product primarily of grand ideas about self-government. Professor Michener and his collaborator, Robert W. Wright, a financial historian at New York University, plan to do just that. The tandem worked for several years on a manuscript arguing that the American Revolution was a direct result of the economic malaise that followed the French and Indian War. Now they have a built-in marketing hook — the current financial crisis — and the publisher, Yale University Press, is hoping to bring the book out as early as next fall. “What I found was that the monetary difficulties faced by the colonies were not very different from modern macroeconomic problems,” Mr. Michener said. As a former student of Ron Michener's, I know that he is a good storyteller - even when the subject is optimal control theory - so the book is something to look forward to (although when they say "hoping to bring the book out as early as next fall" it sounds like I shouldn't hold my breath...). You remain for me the ruler whose general outlook and attitude to the tasks of government are the most sympathetic in the world. You are the only one who sees the necessity of a profound change of methods and is attempting it without intolerance, tyranny or destruction. You are feeling your way by trial and error, and are felt to be, as you should be, entirely uncommitted in your own person to the details of a particular technique. In my country, as in your own, your position remains singularly untouched by criticism of this or the other detail. Our hope and our faith are based on broader considerations. In the field of domestic policy, I put in the forefront, for the reasons given above, a large volume of loan-expenditures under government auspices. It is beyond my province to choose particular objects of expenditure. But preference should be given to those which can be made to mature quickly on a large scale, as for example the rehabilitation of the physical condition of the railroads. The object is to start the ball rolling. The United States is ready to roll towards prosperity, if a good hard shove can be given in the next six months. The 1930 essay comes to my attention via Paul Krugman, who writes "its observations on the crisis at hand remain stunningly insightful, and fit current events all too well." Businessmen have a different set of delusions from politicians, and need, therefore, different handling. They are, however, much milder than politicians, at the same time allured and terrified by the glare of publicity, easily persuaded to be ‘patriots’, perplexed, bemused, indeed terrified, yet only too anxious to take a cheerful view, vain perhaps but very unsure of themselves, pathetically responsive to a kind word. You cold do anything you liked with them, if you would treat them (even the big ones), not as wolves or tigers, but as domestic animals by nature, even though they have been badly brought up and not trained as you would wish. It is a mistake to think that they are more immoral than politicians. If you work them into the surly, obstinate, terrified mood, of which domestic animals, wrongly handled, are so capable, the nation’s burdens will not get carried to market; and in the end public opinion will veer their way. Definitely on the reading list for Eco 317 in the spring. In a commentary for our local NPR station, I make the argument, which I've also made on this blog, that we're getting a little carried away with the depression comparisons. Update (11/24): Slate's Daniel Gross makes a similar argument, to which Paul Krugman responds. In the 1920s excess and rising capacity in the US could be exported, mostly to Europe, while massive foreign bond issues floated by foreign countries in New York permitted countries to run large deficits, but as the US continued investing in and increasing capacity without increasing domestic demand quickly enough, it was inevitable that something eventually had to adjust. The financial crisis of 1929-31 was part of that adjustment process, and it was not just the stock market that fell – bond markets collapsed and bonds issued by foreign borrowers were among those that fell the most. This, of course, made it impossible for all but the most credit-worthy foreigners to continue raising money, and by effectively cutting off funding for the current account deficit countries, it eliminated their ability to absorb excess US capacity. The drop in foreign demand forced the US either massively to increase domestic demand or massively to cut back domestic production. The fact that another consequence of the financial crisis was a collapse of parts of the domestic banking system, leading to banking panics and cash hoarding, meant, as it often does in a global crisis, that the US had to adjust to a drop in demand both domestically and from abroad. But instead of expanding aggressively, as Keynes demanded, FDR expanded cautiously, and in 1937 even decided to put the fiscal house back in order by cutting fiscal spending, thereby stopping the recovery dead in its tracks. ...I worry that the global problem has never been a lack of US demand – it has been lack of Asian demand. The US has already provided a greater share of global demand than is healthy for either the US or, as we have clearly seen, for the world. A massive fiscal expansion by the US would certainly boost global demand, but it would do so at the expense of increasing US indebtedness by far more than it increases demand for US goods (much of the expansion in demand would simply be exported to countries that continue to suffer from overcapacity) and of course it would not solve the global overcapacity problem. It might even exacerbate it. The best that one could hope for, if the US took the lead in fiscal expansion, is that Asian countries make heroic efforts to shift their economies as quickly as possible from export dependence to domestic demand dependence, but I have already argued that with the best will in the world this will be a long and difficult process, and I am not sure anyway that most countries have the political will to force the shift. China, for example, is raising export rebates and talking about depreciating the currency – hardly the actions of a country working hard to reduce global overcapacity. Hm... under the circumstances, I think we might want to try the "massive fiscal expansion" and worry about imbalances later. 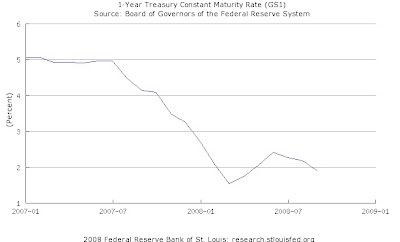 There is no sign that the US Treasury will have any trouble borrowing as much as it wants. The NY Times reports on widespread budget cuts by state governments, who are seeing tax revenues fall and are much more constrained then the federal government in their ability to run deficits. A good candidate for any fiscal stimulus legislation would be increased federal aid to state and local governments. The state cuts do have macroeconomic consequences - state and local government purchases accounted for 12.1% of GDP last year and are the bulk of the "G" component of aggregate demand (bear in mind that much of federal spending is on transfer programs; federal government purchases were 7.1% of GDP in 2007, and this was mostly military spending). The Times story is accompanied by a nifty interactive graphic with state-specific information; they put Ohio's gap at $1.3 billion, or $111 per resident. Now that the Fed is paying interest on deposits, and doing so at the Fed funds target rate, much of what I tell students about how monetary policy works is out the window. This Macroblog post on "the changing operational face of monetary policy" by David Altig looks like a good place to start when I re-write my lecture notes. The real flaw in the government-financed merger proposal is that it spares the companies from bankruptcy reorganization, the very process they need to get their costs and structure in line with market realities. Only a bankruptcy court can reduce the burden of pension and health benefits to 600,000 retirees that are slated to cost the companies $90 billion over the next decade. Only a bankruptcy court can override the state laws that make it difficult and expensive for Chrysler and GM to pare back a combined network of 10,000 dealerships, about 10 times more than Toyota has in the United States. And only a bankruptcy court can impose on members of the United Auto Workers pay and benefit packages comparable to those paid at the nonunionized plants of foreign manufacturers that have been stealing market share from the Big Three for decades. In order to seek so-called Chapter 11 status, a distressed company must find some way to operate while the bankruptcy court keeps creditors at bay. But GM can't build cars without parts, and it can't get parts without credit. Chapter 11 companies typically get that sort of credit from something called Debtor-in-Possession (DIP) loans. But the same Wall Street meltdown that has dragged down the economy and GM sales has also dried up the DIP money GM would need to operate. That's why many analysts and scholars believe GM would likely end up in Chapter 7 bankruptcy, which would entail total liquidation. The company would close its doors, immediately throwing more than 100,000 people out of work. And, according to experts, the damage would spread quickly. Automobile parts suppliers in the United States rely disproportionately on GM's business to stay afloat. If GM shut down, many if not all of the suppliers would soon follow. In that sense, GM, like Bear Stearns, is "too interconnected to fail" - think of the parts suppliers and dealers as "counterparties." Furthermore, the unemployment generated by a GM liquidation would have some serious "aggregate demand externalities." While there is some merit in Perlstein's argument for chapter 11, it is hard to believe the benefits would not outweigh the costs of an intervention at least to the extent necessary to ensure that any bankruptcy would be a restructuring rather than a liquidation (e.g., providing a guarantee for DIP financing). Cohn's piece also has some useful debunking of outdated stereotypes about the US auto industry. Unfortunately some - e.g., Thomas Friedman - persist in believing that the industry's problems arise mainly from a myopic over-reliance on trucks while Toyota virtuously purveys hybrids (GM and Ford also make small cars and hybrids - and the Chevy Volt is coming soon - while Tundras and Highlanders can be found along with the Priuses on Toyota lots). While there may be a grain of truth in it, what is missing from that line of argument is that much of the real financial burden on the automakers is the legacy of the American system of relying on companies to provide welfare state benefits like pensions and medical care. This certainly has put older US manufacturing firms at a disadvantage relative to newer firms, "transplants," and foreign factories (the fact that Ontario surpassed Michigan in auto production is partly attributable to health care costs). Rather than criticize the automakers for treating their workers too well, perhaps we should recognize that their problems partly stem a history of filling the gaps left by US social policy. Any car company that gets taxpayer money must demonstrate a plan for transforming every vehicle in its fleet to a hybrid-electric engine with flex-fuel capability, so its entire fleet can also run on next generation cellulosic ethanol. There is a serious need to reduce carbon emissions and energy use in transportation. The way to do so is not to force automakers to make different cars that nobody wants, but to get consumers to want them. The simplest way to do this would be to raise the gasoline tax (or, more broadly, a carbon tax). The automakers - domestic and foreign - respond to consumer demand; vehicles have gotten larger because people wanted them that way, and they can get smaller and more efficient for the same reason. Bob Herbert draws a parallel with the New York near-bankruptcy in the 1970's, where the federal government did ultimately intervene, after the Daily News ran the famous headline "Ford to City: Drop Dead." Full disclosure: I grew up in the Detroit area (Jonathan Cohn is from Michigan, too) where one of the local TV stations used to run adds exhorting us to "stand up and tell 'em you're from Detroit." Moreover, I'm looking forward to the new, smaller Cadillac that should be available by the time the lease is up on my current (um... well... Japanese...) car; if the policymakers get it right, there might be a turbodiesel version. Update (11/16): The Economist's story assumes chapter 11 would be available, but has some reasons why that could be worse than you might think. Update #2 (11/17): Jeff Sachs wants a Volt. See also Felix Salmon. Hmm... I'm starting to think it may just be my patriotic duty to buy a Solstice GXP Coupe. Update #3 (11/17): I find this speculation to be implausible, but it would be a silver lining to Detroit's woes. Update #4 (11/18): Autoworkers do not make $70 an hour, as Felix Salmon explains. So what kinds of numbers are we talking about? GDP next year will be about $15 trillion, so 1% of GDP is $150 billion. The natural rate of unemployment is, say, 5% — maybe lower. Given Okun’s law, every excess point of unemployment above 5 means a 2% output gap. Right now, we’re at 6.5% unemployment and a 3% output gap – but those numbers are heading higher fast. Goldman predicts 8.5% unemployment, meaning a 7% output gap. That sounds reasonable to me. So we need a fiscal stimulus big enough to close a 7% output gap. Remember, if the stimulus is too big, it does much less harm than if it’s too small. What’s the multiplier? Better, we hope, than on the early-2008 package. But you’d be hard pressed to argue for an overall multiplier as high as 2. When I put all this together, I conclude that the stimulus package should be at least 4% of GDP, or $600 billion. Here's another reason why $600 billion is a good number: it is bigger than China's recently announced $586 billion stimulus. We must not allow a stimulus gap! To deal with the global crisis, how should the US and Chinese governments proceed? First, the US should stop China-bashing in several dimensions. In particular, the PBC should be encouraged to stabilize the yuan/dollar exchange rate at today’s level­, both to lessen the inflationary overheating of China’s economy and to protect the renminbi value of its huge dollar exchange reserves. Since July 2008, the dollar has strengthened against all currencies save the renminbi and the yen, and the PBC has stopped appreciating the RMB against the dollar. So now is a good time to convince the Americans of the mutual advantages of returning to a credibly fixed yuan/dollar rate. There is a precedent for this. In April 1995, Robert Rubin, then US Treasury secretary, ended 25 years of bashing Japan to appreciate the yen­ and announced a new strong dollar policy that stopped the ongoing appreciation in the yen and saved the Japanese economy from further ruin. But this policy was incomplete because the yen continued to fluctuate, thus leaving too much foreign exchange risk within Japanese banks, insurance companies, and so forth, with large holding of dollars. This risk locks the economy into a near zero interest liquidity trap. Second, after the PBC regains monetary control as China’s exchange rate and price level stabilize, the Chinese government should then agree to take strong measures to get rid of the economy’s net saving surplus that is reflected in its large current account and trade surpluses. This would require some combination of tax cuts, increases in government expenditures, increased dividends from enterprises so as to increase household disposable income, and reduced reserve requirements on commercial banks. Then, as China’s trade surplus in manufactures diminishes, pressure on the American manufacturing sector would be relaxed with a corresponding reduction in America’s trade deficit. Worldwide, the increase in spending in China would offset the forced reduction in U.S. spending from the housing crash. The new stimulus announced by China is potentially a huge step towards increasing China's domestic demand - i.e., getting rid of the net saving surplus. Meanwhile, the large slowdown in consumer spending in the US reduces the net saving deficit (though government spending should, at least temporarily, make up much of the gap). So there are indications of a non-exchange rate driven rebalancing (i.e., closing of China's current account surplus and America's deficit). While McKinnon is correct that it is a good thing to take some of the pressure off exchange rates to do all adjusting, fixing the exchange rate would completely close off this channel and leave the Yuan undervalued. Furthermore, intervening to keep the exchange value of the Yuan low is what has been interfering with the PBC's domestic monetary control. Because China has piled up so many Dollar-denominated assets, it is understandable that they would like to protect their value in Yuan terms (i.e., prevent a big Yuan appreciation...), and a nod in this direction may be part of an international negotiation, but fixing the Yuan-Dollar rate only seems to defer a necessary adjustment. Update (11/10): Arvind Subramanian offers nearly opposite policy advice; he would have the WTO go after countries that keep their currencies undervalued (he proposes some carrots to get China to go along). does it take to screw in a light bulb? A: None, they get Hugo Chavez to pay for Cuban technicians to do it for them. After a victory of historic significance, Barack Obama will inherit problems of historic proportions. Not since Franklin D. Roosevelt was inaugurated at the depths of the Great Depression in 1933 has a new president been confronted with the challenges Obama will face as he starts his presidency. 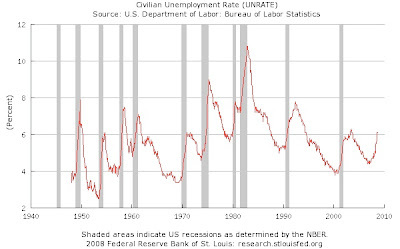 Hmm... unemployment is currently at 6.1%; I wouldn't be surprised to see it rise by January, but it is unlikely to be much worse than when Clinton was inaugurated in Jan. 1993 (7.3%) or when Reagan took office in Jan. 1981 (7.5%). Financial crises occur with some regularity; this may be the worst since the depression, but Clinton and Reagan faced other problems. When Clinton took office, the Federal budget deficit was over 4% of GDP and investment was slumping. The deficit has re-emerged as a problem recently, but it has not reached the chronic severity of the 1980's and 1990's, when it became a central political issue (remember Ross Perot and Paul Tsongas?). Inflation was in double-digits when Reagan entered office, and the Volcker Fed had embarked on a painful effort at disinflation which entailed extremely high interest rates (the Fed Funds rate exceeded 19% at a couple of points in 1980 and '81). Update: Floyd Norris on the Reagan parallel. The unemployment rate rose from 4.6% in October 1973 to 9% in May 1975 and from 5.6% in May 1979 to 10.8% in November 1982, increases of 4.4 and 5.2 points respectively. If we take this cycle's pre-recession low as 4.4% in March 2007, we need to get to 9.6% to be in "worst since the depression" territory by the change metric, and 10.8% by the level metric. Either way, still a long way to go (yes, I am ignoring underutilization; this is important but the data don't go back as far. I would expect that the trends would be similar, though; i.e. that past recessions also saw increases in underemployment). Update #3 (11/9): Justin Fox notes that the combined September-October job loss amounts to 0.38% of total employment. When President Clinton took office, he was forced to choose between keeping campaign promises of more public investment and middle-class tax cuts or focusing on deficit reduction. The conflict played out among his advisors, with Robert Reich representing the former "traditional Democratic" view and Robert Rubin taking the "Eisenhower Republican" side, which ultimately carried the day. That is a useful reminder that an administration's policies can take a very different direction from what a candidate promises or expects. However, if Barack Obama wins tomorrow, it appears he will not face such fundamental differences of opinion among Democratic policy advisors. In the Times, Robert Rubin and Jared Bernstein (of a left-ish think tank) were able to smooth over the differences enough to write a joint op-ed. In more stable times, a budget deficit equivalent to roughly 2 percent of G.D.P. will keep the debt-to-G.D.P. ratio constant, a legitimate fiscal policy goal. In flush times, a smaller deficit would lower the debt ratio and that might be desirable. [W]hat you can see, at least in the short-term, is an incredible level of consensus on large scale stimulus targeted at infrastructure investment. And this sort of elite unanimity matters, as all manner of wavering congressfolk will go to their chosen sage and get the same answer, rather than being divided by slightly esoteric, intra-wonk rivalries. The real question going forward will be whether self-described centrist legislators are willing to heed the advice of Rubin, Summers, and others about the essential need for stimulus, for new spending on infrastructure, and for major investments in health care and education or whether they’re going to choose to play the role of spoilers and try to grab as much special interest cash as possible for their troubles. The 18th Brumaire of the Rational Expectations Revolution? What have they brought us? It is true that our texts were fallible. And it is true that, in the beginning, their critiques shone light upon our misunderstandings. But we mistook a lighting of a candle for a conflagration of divine knowledge. And ecstatic with a small dose of illumination we threw our books upon Savoranola’s fire. Even Michelangelo himself threw his Madonnas onto the pyre (find a relevant link yourself. All I get is wiki). Yet in end, their promises fizzled once the glow of the ambers died. Having abandoned our faith we were left with trying to build a house out of ashes – micro founded ashes – rather than ad-hoc oaken beams. It is time. It is time we returned to the practical knowledge which had allowed us to built a shelter, no matter how shabby, but which could stand up well in the hail storms, even if we did not understand the engineering principles involved. A good pool player knows how to sink the final ball in its pocket at the end of the game, avoiding the eight ball. The knowledge of the laws of physics is immaterial. Perhaps if the game was played on a table with no friction our detractors would have had something useful to say. But we have been in the wilderness for a long time. We are weak. It is the truth and let us admit it, our spirits have been starved of intellectual substance for some time. And they may be for some time yet. But our path is righteous. And if we are going to ever get back upon it we need to first assert our own existence. We are MACROECONOMISTS! We have insights which cannot be derived from the cult of Some- kind- of- Maximization- somewhere- by- somebody- for- some- reason (and who knows who or what) = Microfoundations. Read the whole thing (this means you, Econ 617 students). Consumer confidence fell to its lowest level in at least 40 years, a survey said Tuesday, as falling home prices and steep declines in the stock market took a sharp toll on the faith of Americans in the economy. A widely watched survey by the private Conference Board, which dates back four decades, plunged to its lowest reading on record in October as Americans reported fewer jobs and smaller incomes and curtailed plans for major purchases like cars and appliances. Lowest in forty years? Lower than 1981-82? 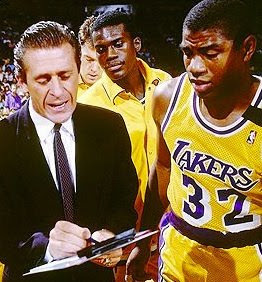 73-74? We have a long way to go before it's that bad, and I doubt things will get that far. Robert Lucas: "I guess everyone is a Keynesian in a foxhole." From Justin Fox, "The Comeback Keynes" (extended quote here). One of the bigger ironies of the financial crisis is that the US has troubled financial institutions, a plunging stock market and a ballooning government budget deficit and demand for our government bonds is increasing: (keep in mind that the price and yield are inversely related). 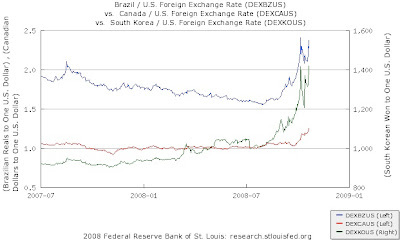 And now we also see a spike in demand for our currency: (foreign currency per dollar). Even the presumably relatively safe Pound and Euro took a plunge last week: (note that the scale is opposite, so the Dollar is still appreciating). 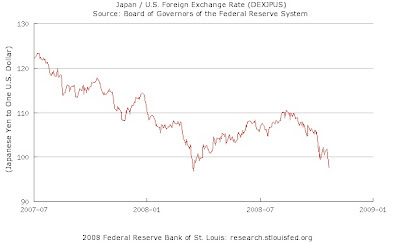 However, the Japanese Yen seems relatively immune, relative to the Dollar, which means it is also jumping in terms of other currencies: In troubled times, demand for assets deemed "safe" (or "liquid" or "quality") traditionally goes up, which is why things like emerging market debt and junk bonds often suffer, regardless of the virtues (or lack thereof) of the issuers. But it is quite remarkable that, for all that is going wrong in the US, we are still on the receiving end of this flight to safety effect. How much of this to attribute to virtue versus good fortune is a good question for international economists and economic historians to contemplate. More immediately, despite all their prudent reserve-building since the crises of the late 1990's, emerging markets are once again getting hit hard. Dani Rodrik sees an urgent need for IMF action. See also Arvind Subramanian, Brad Setser and Naked Capitalism. From a US standpoint, although we are better off with a flight into, rather than out of our currency and assets (which would cause a huge spike in long-term interest rates), the Dollar's rise is hardly benign. Until recently, the mostly-non-panicky drift downward of the Dollar was helping turn around the current account deficit - a sustained move in the other direction would be trouble for exporting and import-competing industries (indeed, Rodrik fears this could lead to protectionism). Another Devil in the Details? It is worth noting that the Canadian banking system, which is an oligopoly of giant national institutions, appears to be holding up quite well. The End of the 1980's? This "interactive graphic" of US economic indicators from the Times is truly impressive. Bernanke, white knight upon a firey steed? "Helicopter Ben" rides to the rescue. [A] humbled Mr. Greenspan admitted that he had put too much faith in the self-correcting power of free markets and had failed to anticipate the self-destructive power of wanton mortgage lending.“Those of us who have looked to the self-interest of lending institutions to protect shareholders’ equity, myself included, are in a state of shocked disbelief,” he told the House Committee on Oversight and Government Reform. Floyd Norris: "What was missing was a regulator who understood markets, rather than worshiped them." Since some of my students seem to actually like Ayn Rand, I will outsource the obligatory Rand-bashing to Dean Baker, who does it well. Actually, I do think Greenspan does deserve some credit for admitting error, at least a little bit. As Keynes said, "when the facts change, I change my mind. What do you do sir?" Update (10/25): This video at Calculated Risk reveals uncanny parallels between Greenspan and Smooth Jimmy Apollo and Captain Renault. Update #2 (10/26): Although Greenspan was a member of Rand's circle and contributed several chapters to "Capitalism: The Unknown Ideal," the Rand-ites have apparently excommunicated him (see also the comments to this post). Hat tip: Marginal Revolution. Unfortunately, Treasury Secretary Hank Paulson’s injection of $125 billion into the nine banks (out of a total capital injection budget provisionally set at $250bn (but bound to rise to probably around twice that amount), carved out of the $700 bn made available (in tranches) by the 2008 Economic Stability Emergency Act, was almost a free gift to these banks. In this it was different from the case of AIG, where the Fed and the Treasury imposed rather tough terms on the shareholders and obtained pretty favourable terms for the US tax payer generally. It was also unlike the case of Fannie and Freddie, where the old shareholders are likely not to recover anything. In the case of the Fortunate Nine, the injection of capital is through (non-voting) preference shares yielding a ridiculously low interest rate (5 percent as opposed to the 10 percent obtained by Warren Buffett for his capital injectcion into Goldman Sachs). Without voting shares, the government has no voice in the running of these banks. It also has no seats on their boards. By contrast, in the Netherlands, the injection of €10bn worth of subordinated debt into ING bank comes with a price tag that includes two government directors on the board and a government veto over all strategic decisions by the bank. In addition, in the the case of the Fortunate Nine, there are no attractively valued warrants (options to convert, at some future time, the preference shares into ordinary shares at a set price or at a price determined by some known formula). Quite the opposite, the preference shares purchased by the US state, can be repurchased after three years, at the banks’ discretion, on terms that are highly attractive to the banks. The US tax payer is not only getting a lousy deal compared to private US investors like Buffett, (s)he is also doing much worse than the British tax payer in the UK version of Paulson’s capital injection (£37 bn so far out of provisional budget of £50bn). The UK preference shares have a 12 percent yield and come with government-appointed board members. The terms are not good for the US taxpayer, that is, but they are favorable Paulson's financial sector friends. I would feel much better if Bernanke - or the Obama administration - was running the show. Citing rising food and fuel costs, two subsidiaries of Archway & Mother's Cookie Company Inc. have filed for bankruptcy, effectively shutting down the firm's U.S. operations. In a news release, Archway said the subsidiaries, Mother's Cake & Cookie Co. and Archway Cookies LLC, filed for Chapter 11 bankruptcy on Monday in the U.S. Bankruptcy Court for the District of Delaware. The announcement came three days after the company sent notices to the cities of Battle Creek and Ashland, Ohio, stating that the two locations would close, putting approximately 160 people out of work, 59 of those in Battle Creek. Can these guys get a bailout, please? And if "rising food and fuel costs" are really the problem, can't they change their mind now that the downturn has caused commodity prices to fall? The next stimulus check goes straight into cookies. The key to Keynes was his commitment to preserving the market economy by making it work. He was dismissive of Marxism but believed the market economy could survive only if it earned the support of the public by raising living standards. The role of the economist, he believed, was to be the guardian of “the possibility of civilisation”, and no economist has ever been more suited for that role. No one has bettered Keynes in his understanding of the psychology of financial markets. "Most . . . of our decisions to do something positive . . . can only be taken as a result of animal spirits . . . If animal spirits are dimmed . . . enterprise will fade and die" is one famous remark. "Speculators may do no harm as bubbles on a steady stream of enterprise. But the position is serious when enterprise becomes the bubble on a whirlpool of speculation. When the capital development of a country becomes a by-product of the activities of a casino, the job is likely to be ill-done" is another. Professional investment, he wrote, is like "a game of Snap, of Old Maid, of Musical Chairs," whose object is to pass on the Old Maid -- the toxic debt -- to one's neighbor before the music stops. What makes the game toxic is not greed, which is universal, but uncertainty masquerading as certainty. "The outstanding fact is the extreme precariousness of the basis of knowledge on which our estimates of prospective yield have to be made," Keynes wrote in his great book "The General Theory of Employment, Interest, and Money" in 1936. We disguise this uncertainty from ourselves by assuming that the future will be like the past, that existing opinion correctly sums up future prospects, and by copying what everyone else is doing. But any view of the future based on "so flimsy a foundation" is liable to "sudden and violent changes. The practice of calmness and immobility, of certainty and security suddenly breaks down. New fears and hopes will, without warning, take charge of human conduct . . . the market will be subject to waves of optimistic and pessimistic sentiment, which are unreasoning yet in a sense legitimate where no solid basis exists for a reasonable calculation." Keynes accused economics of being itself "one of these pretty, polite techniques which tries to deal with the present by abstracting from the fact that we know very little about the future." While Skidelsky is right that Keynes' discussion of the psychology of investment booms and busts is too often neglected - it has been left out of the "Keynesian" economic models in our textbooks - I woudn't go so far as to say that we've forgotten everything Keynes taught us. A number of people have lately been invoking another important Keynesian lesson, the role of government in propping up "effective demand" through fiscal policy. If Plan F fails, we move to Plan G: we pull the Keynesian fire alarm and begin an enormous government infrastructure building programme in the whole North Atlantic to keep away depression. [T]here’s not much Ben Bernanke can do for the economy. He can and should cut interest rates even more — but nobody expects this to do more than provide a slight economic boost. Update (10/19): Paul Krugman has the long version of the Keynes quote. Many economists believed that the heart of the government's initial plan to pay $700 billion for toxic assets was aimed at the wrong target. Purchasing mortgage securities from banks wouldn't do anything to kick-start lending and get credit flowing again, they said. Rather, banks would use the proceeds they got from the Treasury to pay off debtors, and those debtors would use the proceeds to buy safe assets. They said a wiser course -- the one the Treasury now seems to have come around to -- was for government to rebuild the badly depleted cash levels on bank balance sheets. That would cushion institutions against future losses, giving them the wherewithal to lend again. Other hitches in the original plan include coming up with a price for mortgage securities that is above the "fire sale" level they would draw on the open market, but not so high that taxpayers end up getting taken for a ride. The Treasury move is a sign of how, as international efforts to contain the crisis continue this weekend at meetings of the International Monetary Fund and World Bank, economists' ideas for solutions are influencing policy and entering the public discourse. Hat tip (not surprisingly) to Mankiw, who says "score one for the ivory tower." Near the end of the General Theory, Keynes wrote: "Madmen in authority, who hear voices in the air, are distilling their frenzy from some academic scribbler of a few years back." Perhaps we should make that: "blogger of a few days back." That's the sentence immediately after the one I cited in this recent post, noting that the Congressional modifications to the proposal included opening the window for an equity component which Paulson is now jumping through (nice work, Senator Dodd). At the present moment people are unusually expectant of a more fundamental diagnosis; more particularly ready to receive it; eager to try it out if it should be even plausible. But apart from this contemporary mood, the ideas of economists and political philosophers, both when they are right and when they are wrong, are more powerful than is commonly understood. Indeed the world is ruled by little else. Practical men, who believe themselves to be quite exempt from any intellectual influences, are usually the slaves of some defunct economist. Madmen in authority, who hear voices in the air, are distilling their frenzy from some academic scribbler of a few years back. I am sure that the power of vested interests is vastly exaggerated with the gradual encroachment of ideas. Not, indeed, immediately, but after a certain interval; for in the field of economic and political philosophy there are not many who are influenced by new theories after they are twenty-five or thirty years of age, so the ideas which civil servants and politicians and even agitators apply to current events are not likely to be the newest. But, soon or late, it is ideas, not vested interests, which are dangerous, for good or evil. Keynes continues to be very relevant. From a macroeconomic perspective, however, changes in tax rates are but one of many factors that drive the time path of gross domestic product (G.D.P. ), savings, investment, employment and other such variables. By itself, changing tax rates steers the economy about as much as would tapping an elephant on the leg with a chopstick. There may be some effect, but typically it is small and dwarfed by other effects. He provides a chart showing that the share of investment in GDP fell during the Reagan/Bush years (i.e., in the wake of the 1981 tax cuts), rose in the Clinton years (i.e., following the 1993 tax increase), and has fallen again since the 2001 and 2003 tax cuts. A point he doesn't make: this pattern would be consistent with the hypothesis that "crowding out" prevails - i.e., that government borrowing, which ballooned in the Reagan and (to a lesser extent) G.W. Bush administrations, displaces private investment. First, 100 economists is not actually all that many, given the number of economists in our country. Second, the list of signatories actually has only 90 economists on it. (Count for yourself.) This trouble with basic arithmetic might explain the McCain campaign's stated beliefs in such fallacies as tax hikes always cause revenues to fall. Was the campaign unable to find 100 economists? The list certainly does not suggest excessive discrimination about credentials. It's heavily larded with GOP apparatchiks now residing in the right-wing think tank world (my favorite is "economist" George Schultz of the Hoover Institution), as well as two signatories who list their affiliation as "McCain-Palin 2008." The takeaway here is that, even with the most generous standards, the campaign couldn't find 100 economists in the country to badmouth Obama's proposals, let alone endorse their own. I'd disagree slightly: some of the signatories do actually have pretty strong academic credentials. But we do know that most economists support Obama; I'm sure if his campaign tried, they could gather a more impressive list. Hmm... back in July, McCain had an endorsement from 300 economists... have 210 of them jumped ship? Obama really benefitted from his years as a law professor. He was fluent and very much at ease walking and talking at the same time. He had a professor's knack for making eye contact and maintaining it while he walked a questioner through a multi-step response. And his answers were much more concrete and intuitive than I'd ever heard them. It's as though it took fielding questions from ordinary people to remind him of this latent professorial talents. I have found that such talents, unfortunately, do not come automatically with being a professor. Over time, this function of the Fed has receded into the background, but it is now again front and center, as the Fed continues to step up its lending activity, and is now even planning to buy commerical paper. Econbrowser offers an excellent summary of the action, so far, on the Fed's balance sheet. On the Times' new economics blog, David Leonhardt has praise for Bernanke. 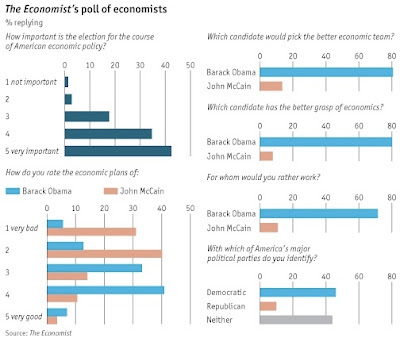 The Economist has surveyed economists' opinions about McCain and Obama. The results are overwhelmingly in Obama's favor: They didn't just ask any economists - the survey was sent to 683 NBER research associates, an elite subset of academic economists, of which 142 responded. A somewhat broader sample of American Economic Association members (a less elite group - even I am in it) surveyed by Scott Adams also favored Obama, though less overwhelmingly (see this earlier post).